Today, Johnson & Johnson's BabyCenter and the Interactive Advertising Bureau's Mobile Marketing Center of Excellence is releasing a study that dives into how young moms—18 to 32 years old—in the U.S., Brazil, Canada, China and the United Kingdom use mobile devices and respond to advertising. Millennial moms in four of the countries (the U.S., United Kingdom, Canada and Brazil) favored ads with a money-saving incentive—like a deal or sale—versus a promo targeted to their age or life stage. Meanwhile, moms in China were equally responsive to both types of digital ads. Moms were also shown specific kinds of creative ad content. Images of babies were most likely to grab a their attention, followed by pictures of families and moms holding babies. (The results below show the percentage of U.S. moms who responded to various photos). BabyCenter's data also looks at how moms view native advertisements. Twenty percent of U.S. moms trusted native ads while only 15 percent of Canadian moms said the same. Thirty-six percent of Brazil moms said they trusted sponsored content. If a native ad is made with high-quality content (like an educational article or video), 76 percent of Brazilian moms said they would have a positive perception of an advertiser. To compare, 54 percent of American, 50 percent of Canadian, 67 percent of Chinese and 53 percent of U.K. moms said the same. According to BabyCenter, the average U.S. millennial mom spends 2.8 hours per day on a smartphone or tablet. That number is higher than the 2.3 hours that moms spend watching TV. As moms rely more on smartphones and tablets, the average American woman spent 1.7 hours a day on a desktop computer last year, down from 2.1 hours in 2013. Outside of mobile, the report also looked at how motherhood changes the way consumers view brands. Within the U.S., 63 percent of moms have altered their purchase criteria for groceries and food; 52 have changed how they buy cleansers and detergent; and 48 percent have switched the personal care products they buy. The research also dug into which groups of moms were most likely to use a smartphone while shopping. 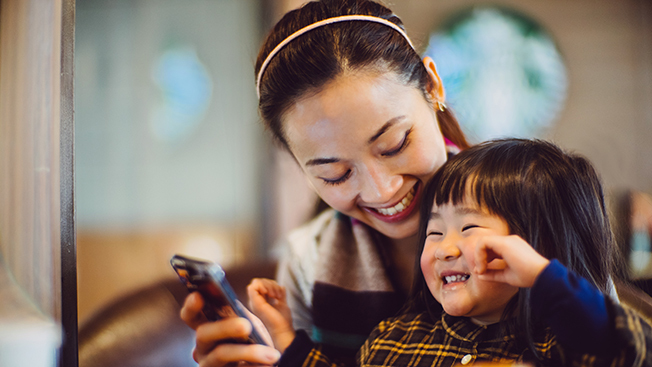 Eighty-one percent of U.S. moms admitted to shopping with a mobile device. Meanwhile, 79 percent of Chinese moms, 73 percent of Canadian moms, 55 percent of Brazilian moms and 63 percent of U.K. moms said the same. And when shopping with a smartphone in a store, 62 percent of U.S. moms search and download mobile coupons while 51 percent either look for better prices or recipes.